Jackie Nickerson, Green Room, 2005. Media wise - lightjet print on Fuji Crystal archive paper, 139.7 x 109.2 cm. Collection Irish Museum of Modern Art Purchase, 2006. ROSCOMMON.- Fabric of Identity, an exhibition from the Collection of the Irish Museum of Modern Art, opens to the public at the Roscommon Arts Centre on Friday 16 November 2012 at 6.00pm. Dress is an instant and effective display of identity and an important component of our daily lives. By means of clothing, individuals establish their sense of self as well as their place in society. Fabric of Identity explores the presentation of individual and collective identities, private and public personas through a selection of work from the IMMA Collection by artists Marina Abramović, James Hanley, Les Levine, Jackie Nickerson and Janet Mullarney. The third collaboration between Roscommon Arts Centre and the Irish Museum of Modern Art the exhibition is especially curated for the Arts Centre as part of the IMMA National Programme. The majority of works in the exhibition present the portrait and varying degrees to which individuality is expressed or confined via clothing. Janet Mullarney, however, employs the physical fabric in her sculpture Gift, 2001, to convey the concept of confinement. Commenting on the work Mullarney explained how Gift derived from a small image seen of a baby Jesus holding out a little garment that looked very like my shirts, now become straight-jackets. The straight-jackets contain various layers and thoughts, one musing on the idea of how it is from the moment we are born we start to die, an incontestabile and horrific thought that we can spend a lifetime trying to make sense of, but can reach no conclusion nor circumvent. Alongside this devastating thought the parallel thought is of life as a gift. The work reflects the confines that society may place upon us and how our communities simultaneously protect and restrict us. 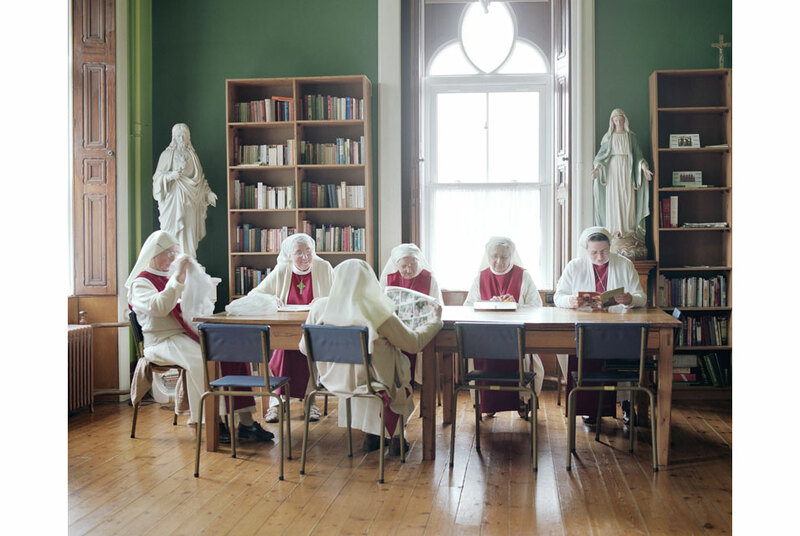 Also inspired by religious imagery Jackie Nickersons Green Room, 2005, is a compelling portrayal of a hidden world, the Catholic religious orders of Ireland. The work is part of a series of work by Nickerson entitled Faith. Her combination of gentle portraits and simple documentation of daily rituals and communal devotion suggest an austere existence grounded in optimism, strength and contentment. The simplicity of Nickersons images invokes the muted and restrained palette of Fra Angelico, bringing an often beatific air to her tranquil subjects. Whilst never suggesting that she is able to divine or represent the veiled mysteries of faith, Nickerson does manage to honestly present a vocational life driven by clarity of purpose and personal courage. Les Levines The Troubles: An Artist's Document of Ulster, 1972, is a group of 80 photographs forming part of a series of works for which the artist coined the terms media sculpture and media art. A selection of this series was made for the exhibition. Speaking of the photographic suite Levine says The piece is extremely colourful. It deals with every aspect of the situation. It goes into Catholic homes, Protestant homes, churches, funerals, explosions...My approach was to take it from the human point of view, not the political. So in all cases, I tried to show the people involved and to evoke some state of mind that they were representing in the photo. I avoided taking sides or showing bias. I think the photos speak for themselves and tell their own extraordinary story. Marina Abramović is widely regarded as one of the leading performance artists in the world. Her performances push the human body to extreme limits of endurance, drawing the audience in so that each person, artist and viewer alike, must examine their own place in the human drama and take responsibility for their own actions. A firm belief in the power of mind over body is central to her work. The photographic diptych Role Exchange, 1975, documents a performance of the same name in which Abramović exchanged places with a woman from the Red Light district in Amsterdam. The woman attended the opening of an art exhibition while Abramović took the womans place at the window of her house of business. Each woman took full responsibility for the experiences that the role exchange brought with it. In The Would-Be's, 1995, James Hanley also creates an unsettling portrait image for the viewer. The triptych combines portraits of three of the artists friends with a wryly humorous commentary on the ambitions of youth. The vividness of the painting, the almost garish colour co-ordinations and the mysterious environments in which the three are placed are disconcerting. Through their dress and demeanour references are made to popular culture, the cinema, the Church and history, all presented with characteristic clarity and realism. The full frontal compositions of the three panels, unusual in a triptych, give an air of permanence and authority to the images which is belied by the unsettling light and the morose facial expressions. This collaboration with Roscommon Arts Centre marks the end of a year long programme dedicated to showing work from major galleries and collections at the Arts Centre. Designed to provide audiences with opportunities to see work from artists working in both traditional and modern artforms locally, the programme has included shows from The Model, Sligo, VISUAL Centre for Contemporary Art, Carlow, and Limerick City Gallery of Art. The National programme, now in its fifteenth year, is designed to promote the widest possible involvement with the Museum's Collection and programmes throughout Ireland. The National Programme establishes the Museum as inclusive, accessible and national, de-centralising the Collection, and making it available to communities in their own localities, on their own terms, in venues with which the audience is comfortable and familiar. Fabric of Identity continues until 14 December 2012. Admission is Free.